"Photos/Information courtesy of the US Air Force Museum"
When the U.S. entered WW II, the A-20 attack bomber had already been proven in combat by British and French forces. On July 4, 1942, six A-20s flown by American crews of the 15th Bombardment Squadron accompanied six flown by British crews on a low-altitude mission against four Dutch airfields, the first U.S. daylight bombing raid in Europe. 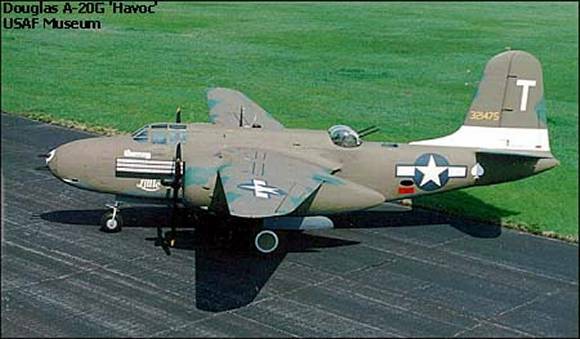 The versatile A-20 was used in the Pacific, Middle East, North African, Russian, and European theaters. Some A-20s equipped with radar equipment and additional nose guns were redesignated as P-70s and were used as night fighters until replaced in 1944 by the P-61 "Black Widow" with its increased high altitude performance. A-20 production halted in September 1944 with more than 7,000 built for the U.S. and its allies. 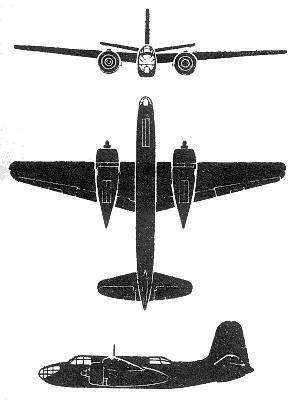 The A-20G was the first series to have a "solid" nose; the aircraft on display is one of 2,850 -Gs built. 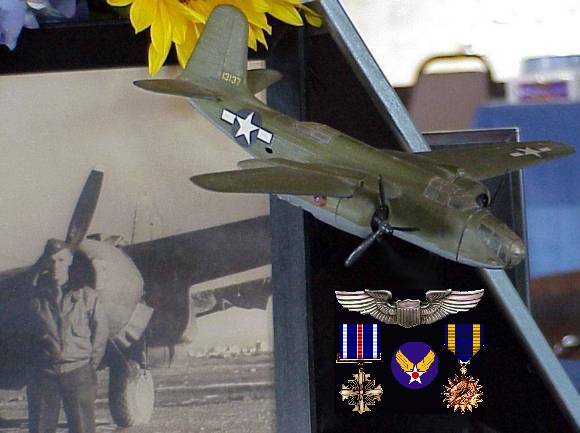 It was donated by the Bankers Life and Casualty Company of Chicago in 1961, and is painted as "Little Joe" of the 5th Air Force, 312th Bomb Group, 389th Bomb Squadron. Span: 61 ft. 4 in. Engines: Two Wright R-2600s of 1,600 hp. ea. Constituted as 47th Bombardment Group (Light) on 20 Nov 1940. Activated on 15 Jan 1941. Patrolled the west coast for several weeks after Japan attacked Pearl Harbor, then trained for duty overseas. Moved to North Africa, Oct-Nov 1942. Assigned to Twelfth AF. 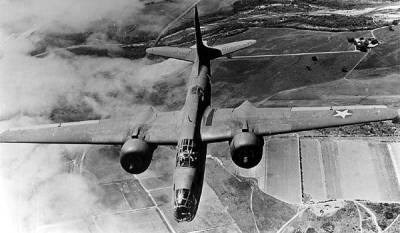 Served in the Mediterranean theater until the end of the war, using A-20's and (after Jan 1945) some A-26's for support and interdictory operations in which the group attacked such targets as tanks, convoys, bivouac areas, troop concentrations, supply dumps, roads, pontoon bridges, rail lines, and airfields. Also flew numerous night intruder missions after Jun 1944. Began operations by flying low-level missions against the enemy in North Africa during the period Dec 1942-May 1943. When Axis forces broke through at Kasserine Pass in Feb 1943, the 47th Group, though undermanned and undersupplied, flew eleven missions on 22 Feb to attack the advancing armored columns and thus to help stop the enemy's offensive - an action for which the group was awarded a DUC. Remained active in combat during Mar and Apr 1943 while training for medium-level bombardment. Participated in the reduction of Pantelleria and Lampedusa in Jun 1943 and the invasion of Sicily in Jul. Bombed German evacuation beaches near Messina in Aug. Supported British Eighth Army during the invasion of Italy in Sep. Assisted the Allied advance toward Rome, Sep 1943-Jun 1944. Supported the invasion of Southern France, Aug-Sep 1944. Attacked German communications in northern Italy, Sep 1944-Apr 1945. Received second DUC for performance from 21 to 24 Apr 1945 when, in bad weather and over rugged terrain, the group maintained operations for 60 consecutive hours, destroying enemy transportation in the Po Valley to prevent the organized withdrawal of German forces. Returned to the US in July 1945. Trained and participated in maneuvers. Equipped with B-45's in 1948. Inactivated on 2 Oct 1949. Barksdale AFB, La, 19 Nov 1948-2 Oct 1949. Sculthorpe, England, 1 Jun 1952-8 Feb 1955.